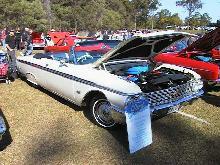 The Galaxy Sunliner was Ford's only convertible in 1962. It had a 6,638 cc V-8 engine of either 390 or 411 bhp at 5,800 rpm. The powerful engine took it to a top speed of more than 125 mph (200kph).